The Remington Arms Company was founded in 1816 and has been providing high quality munitions for shooters around the world ever since. 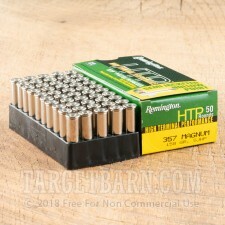 Well-known for using industry innovation and quality components, Remington is one of the most trusted names in shooting. 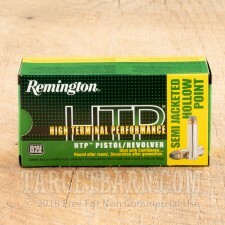 You get 500 rounds of new production Remington "High Terminal Performance" HTP 357 Magnum ammo. Every cartridge is loaded with a heavy 158 grain semi-jacketed hollow point (SJHP) projectile designed for impressive terminal performance. With a muzzle energy of 1235 feet per second and a muzzle velocity of 535 foot pounds, these rounds deliver massive energy transfer and impressive expansion. 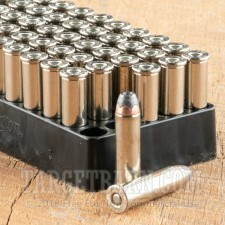 Each round is boxer primed, non-corrosive and loaded in a factory fresh reloadable brass casing. A waterproof sealant is applied to the case mouths and primers of each cartridge to ensure reliable and consistent performance no matter the shooting conditions. This extra level of consistency combined with their impressive stopping power, makes these rounds ideal for home protection, personal defense, and concealed carry.